Watkins Bible Bookbinding Factory stood on the site of what is now the children’s playground. 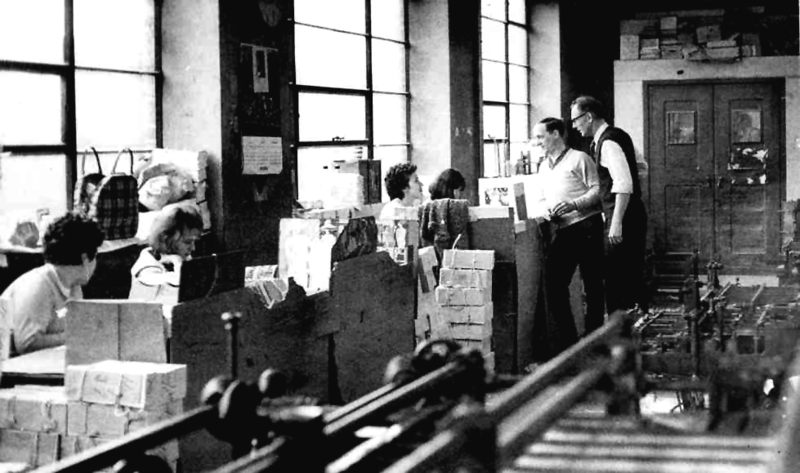 It was one of the area’s biggest factories. 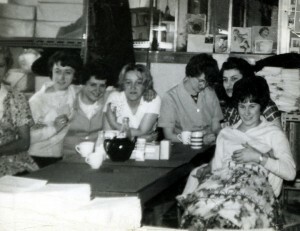 At its peak it bound 1 million bibles a year, employing 400, mainly women, known as ‘folder girls’. It was deemed to offer more ‘respectable’ employment than some other local factories. Suffering World War 2 bomb damage, the factory was rebuilt in late 1950s but eventually closed in 1977. 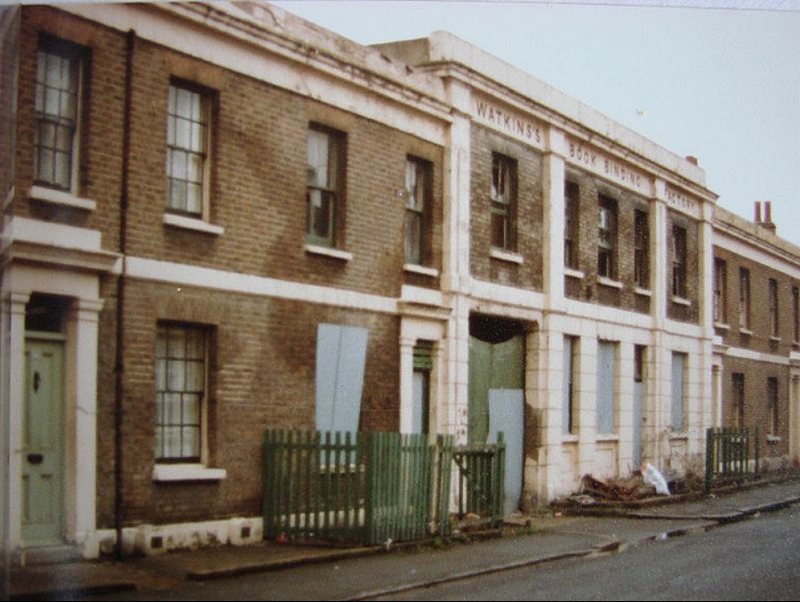 Watkins’ unassuming factory entrance was in the middle of a terrace at 6-8 Cowan Street, but the factory backed onto Scarsdale Road – both roads which were lost when Burgess Park was created. 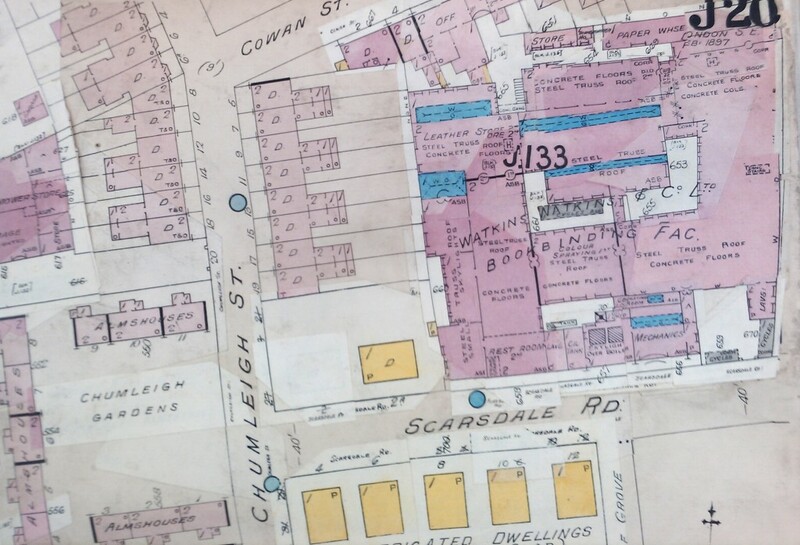 The factory took up almost an entire block bounded by 4 streets – a larger footprint than Chumleigh Gardens. In the plan above, the Cowan St entrance is at top centre. The yellow squares are post-war prefabs – emergency housing on bomb sites. Watkins’ trade was solely in binding bibles. During the Second World War, the factory was damaged by bombs which also destroyed a couple of houses on Cowan Street, leaving a gap in the terrace which remained unfilled until the whole street was eventually demolished. 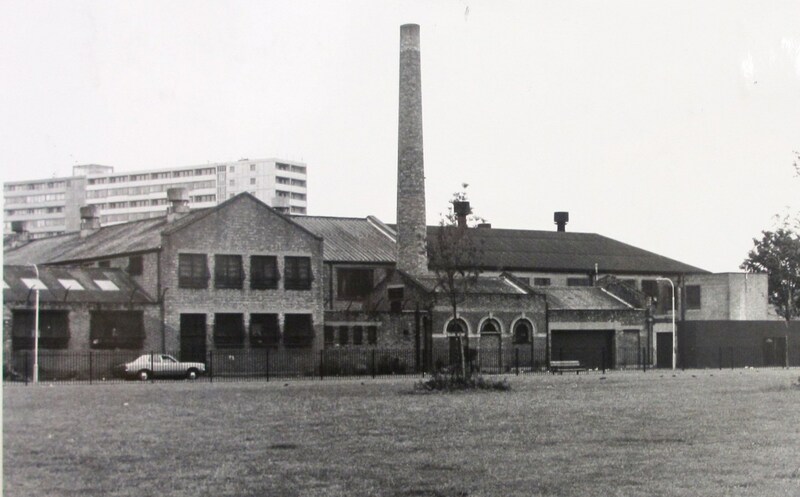 The factory was rebuilt in the late 1950s. Former employee Dave Trutzenbach remembers his 6 year apprenticeship with Watkins which began when he was 15 years old. Each week, on Tuesdays, he attended Holborn Art and Craft school, for hand bookbinding classes, and later helped to produce thousands of bibles ranging from pocket editions to lectern-size and Braille editions. 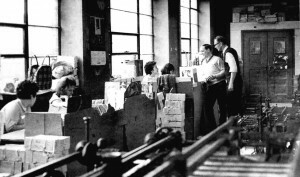 However Watkins did not diversify, and as business dwindled, there were also issues with trade unions, leading its elderly owner Mr. Charles Burt to shut the factory down in 1977. Today Dave owns his own print company in New Jersey, USA, while many other employees went on to teach bookbinding at the local art college that is now the University of the Arts Camberwell. Today the children’s playground in Burgess Park replaces the spot where Watkins Bible Factory once stood. My parents Joan & Richard Line worked at Watkins, my mother passed away however, Dad Richard now 85 would love to be in touch with old colleagues. Can you help with this? Not really a response to your question, but I recently acquired a car, a white Lancia Flaminia GT. Watkins & Watkins are listed as the first owner, in 1964. It was sold in 1970 (unknown owner) and then onto a Paul Collins in 1972. It was a rare and expensive car when new, and I wonder if you father has any recollection of it? Any information would be much appreciated, as I would like to build up a history of the car. My mother in law worked there – Grace Mason, then Rowing. I am emailing back and forth with Mr. Dickie Lines – a Watkins colleague – and his family. Sent him over a nice long letter and all the photos I took when working at Watkins.